The present study examines young adults’ use of social media websites, such as MySpace, Facebook, and YouTube, to post public images and videos of themselves depicting alcohol consumption, inebriated behavior, or recreational marijuana use. 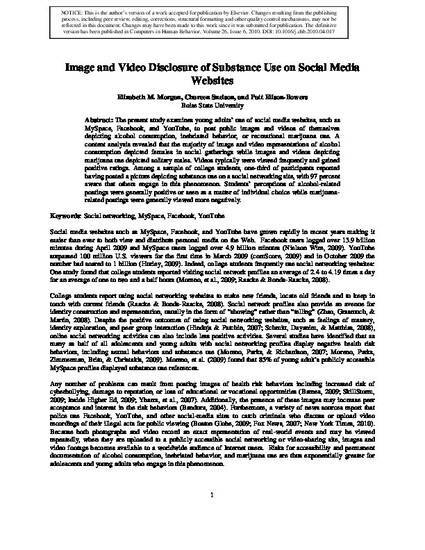 A content analysis revealed that the majority of image and video representations of alcohol consumption depicted females in social gatherings while images and videos depicting marijuana use depicted solitary males. Videos typically were viewed frequently and gained positive ratings. Among a sample of college students, one-third of participants reported having posted a picture depicting substance use on a social networking site, with 97 percent aware that others engage in this phenomenon. Students’ perceptions of alcohol-related postings were generally positive or seen as a matter of individual choice while marijuana-related postings were generally viewed more negatively.